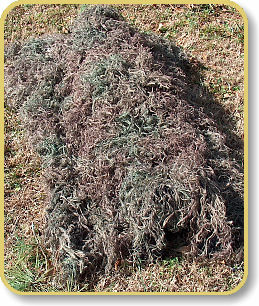 Use as a Goose Blind, Blanket, Cover a Tree Blind, or put two together for a Lean-to or Tent. Jute thread attached to a 4 x 6 Nylon Netting. Includes a package of Black zip ties to help secure to a tree or ground blind. 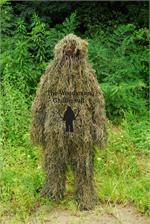 Ghillie Suits offers all our products on the finest and strongest materials we could find. All our products are based on a 100% Nylon netting with a 500 lb. Tensile strength. Our Jute thread is 1-Ply, 10 lb. Tensile strength, made from 100% Tossa Jute Fiber. We hand tie 4-5 strands of the Jute thread to every knot. Thats 40-50 lbs. Of strength at every knot! When hanging vertical, the Jute thread hangs down another 11" allowing the unit to cover a larger surface area.